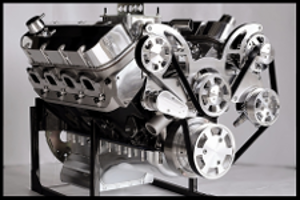 BBC BIG BLOCK CHEVY 427 454 496 TALL ALUMINUM FABRICATED VALVE COVERS SATIN ALUMINUM FINISH. LONG BOLT STYLE. NO ACC. HOLES. These valve covers do not have accessory holes in them. This is to allow for custom placement. The inside height is 3.30" not including the valve cover gasket. 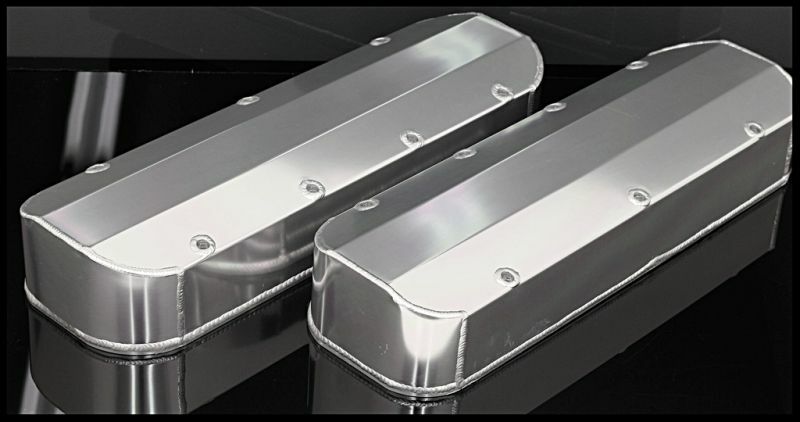 These valve covers will accommodate most roller rockers on the market. Some of the over sized aluminum roller rockers may pose a clearance issue in the corner area of the valve cover. A simple modification to the rocker is done by grinding the outermost corner a slight amount. This is standard in the engine building industry and causes no problem whatsoever to the rocker. The reason the corners on the bbc valve covers are somewhat rounded and tapered is to allow better clearance for items in the engine bay. Most stud girdles on the market are not a problem with these valve covers. These are considered a tall valve cover. The billet aluminum rail is approx. 240 thou. thick. This is thicker than many on the market and has a dramatic effect on reducing oil leaks. Most of our bbc engines we build use this style of valve cover. We offer several styles but this in our most popular. This is a very good quality set of valve covers. Beware of others offering similar valve covers for a lower price. Fit and finish are often compromised. We use these exact valve covers on many of our bbc engines. THESE ARE A SET OF TRUE TALL BBC CHEVY ALUMINUM FABRICATED VALVE COVERS. We have used these valve covers on thousands of our high performance engines for over 12 years without any issues. On occasion, you may notice a slight degree of warpage on the rails before installation. This is due to the heat generated by the massive amount of welding done around the outer edge of the rails. This warpage is not a problem. When the valve covers are bolted on, they will pull down flat and seal well. Any micro amounts of variation left over after you have bolted them down will be compensated for by the gaskets. Any and all fabricated valve covers with such welding on the rails will have this characteristic. It's simply not a problem in the least. We dyno many of the engines using these valve covers. The engines are brought up to considerably high rpm levels, and rarely do we ever see any signs of oil seepage. They seal very well.